Time for another What’s on Your iPad post. I’m still finding these great fun – partly because I just love seeing how others get the most out of their iPad and also because they’re a great source of ideas. I have a 64-GB 3rd-gen Verizon LTE model. We had a 32-GB WiFi first-generation model that belonged to my wife and for this one, I knew I needed more space since our original was nearly filled up with apps. I wasn’t going to go LTE until I found out that Verizon allows you to use the iPad as a WiFi hotspot at no extra charge. I’m still not thrilled with the data plan pricing, but I love the hotspot feature. My wife upgraded her 32-GB first-gen model to a 3rd-gen white model, same size, so we have two iPads in the house now. I use a blue Smart Cover and that’s all. Our first-gen iPad never left the house and it was fine without a case of any kind. I’m not a fan of adding more bulk to the iPad. What’s on your iPad dock currently? Do these apps pan out as your most frequently used? The standard apps — Safari, Mail, Music and Photos along with two others, Twitter and the Digits calculator, which I use all the time. I use Mail pretty constantly and we have a lot of photos of our kids on the iPad. Maybe I’ll swap out Music for something I use more often at some point. I use Facebook, Reeder (an RSS feed application), Spotify and Wunderlist (to-do list app) regularly. Reeder is my go-to app for news even though I know there are other apps that do it more visually like Flipboard. For work, I use social media apps quite a bit as well as email and Dropbox for moving files around. How do you arrange your home screens? Do you use folders at all / heavily? Yes, lots of folders. 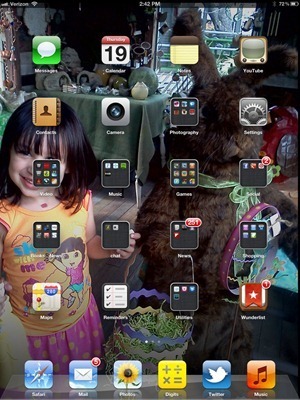 I do children’s app reviews for Kirkus Reviews and on my wife’s iPad there are seven full folders with just storybooks. I try to keep the number of home screens under two or three, but I haven’t figured out a great system to organize everything. There’s a lot of overlap between my Video and Entertainment and Music folders, for instance. 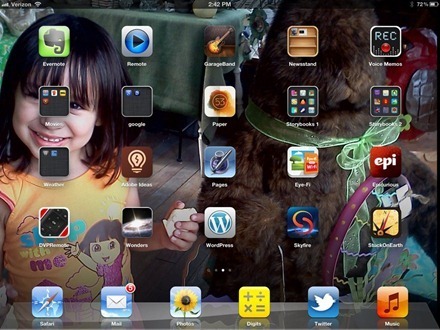 What are some of your most used productivity apps on the iPad? Any that you use for work? Dropbox, the Google App (for Google Docs) and Evernote are very useful to me for document editing. I use Skitch for light photo editing (especially when I want to add captions or arrows to an image for comedic effect). For my personal websites, I use the WordPress app quite a bit to approve comments and to make minor changes to blog posts. I have Pages, but I have yet to really have any reason to use it. Do you read any newspaper or magazine apps on the iPad? Do you subscribe to any? I use the Austin American-Statesman app quite a bit to skim my own newspaper and I have several apps from NPR, the New York Times and USA Today, but to be honest, most of my reading is done in Reeder. Even keeping up with my RSS feeds is enough of a challenge. How much, if any, book reading do you do on the iPad? Quite a bit! I’m finishing the third "Hunger Games" book right now in the Kobo app, which I didn’t like at first, but I’ve gotten used to Kobo’s interactive/social features and I have come to appreciate them. First iPad book I read was Stephen King’s "Under the Dome" which is just a very, very long book. I alternated between the print version and the iBook. I really wish more publishers bundled a digital copy with print versions of their books. I’d totally pay a little extra to have access to an ebook with my paper-book purchases. Any favorite iPad games or fun time fillers? Currently, I’m trying to keep up with all my friends’ drawings in "Draw Something." I really love "Sword & Sworcery EP," "Plants vs. Zombies," "Jetpack Joyride," "Words With Friends HD" and "Bejeweled Blitz." Have you got a ‘hidden gem’ type iPad app that more people should know about? I think Skitch is great for any kind of quick-hit photo editing. ComicsX is a gem for anyone who has an interest in comic books. One of the best family-friendly story apps I’ve reviewed is "The Fantastic Flying Books of Mr. Morris Lessmore." Just a stunning work of art, wonderfully done, and completely separate from the animated short. Brian Cox’s Wonders of the Universe is also a show-stopper. Any killer apps you think are missing from the iPad App Store, apps you’d love to see come to the iPad? Four that I use constantly in their iPhone form: Instagram, Pinterest, the quiz app Qrank and Spotify. I’d use them a lot more if there were iPad versions. Do you tend to pay much attention to your home or lock screen wallpaper? Change it up often? I don’t change them too often; I use photos of my daughters and as they get older, I may change them out every few months. Big thanks to Omar for the great answers. I’m a huge fan of The Fantastic Flying Books of Mr. Morris Lessmore (picked it as my favorite overall in our list of Best iPad Apps of 2011) and Wonders of the Universe too. I need to compare notes on storybook apps with Omar sometime. If you enjoyed this post, you may want to check out the excellent previous entries in the What’s on Your iPad series too. Love these keep them coming! I have many apps, but for now the app I recommend to EVERYONE is PenUltimate. This app is the digital paper students, teachers, architects, moms, dads, uncles, aunts, artists would use on a daily basis as personal OR collaborate over the internet in one file. Think of it as a scratch pad that can be shared to edit or just to show. Go Green with the kids drawings. Then email them to grandparents. Simple, sounding, right? With a stylus it is even better, though not needed.